As Millennials and Gen-Xers battle for jobs and income in a challenging work environment it seems natural that small cars and small sport-utility vehicle sales would blossom. Affordability and a high degree of usability would seem to be just what the new car/ute buyer would crave. So it’s no surprise that a host of small utes are being launched this year, with Chevrolet decidedly in the hunt. Chevy already had the Aveo and Sonic small cars, but for 2015 launches the Chevy Trax a small ute riding on a 100.6-inch wheelbase and extending a modest 168.4 inches. That’s just about four inches longer than the recently tested Nissan Juke and Trax has a 1-inch advantage in wheelbase. Yet unlike Juke, the Trax makes a compelling argument for small utes or crossovers. It’s fun to drive with nimble handling and a pleasant ride. While obviously trim, with a modest rear overhang, it’s reasonably attractive in a fit-in-with-the-neighbors sort of way. Folks won’t laugh at you. And if they ride with you and know what you paid for a Trax, they may even envy you. Here’s why! Consider this the facts on Trax. 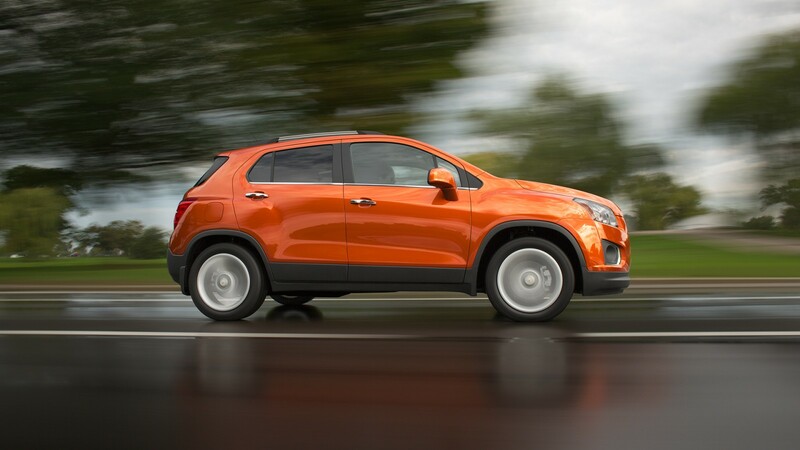 Trax, which is sold as the Holden Trax in Australia and built by General Motors in South Korea, is useful, equipped well at a low price, is available with all-wheel-drive and delivers excellent fuel economy. The Chevy features a modest 1.4-liter I4 with variable valve timing and a turbocharger. This setup is becoming the norm for many cars and crossovers, a small turbo engine that delivers a fair amount of torque to get you rolling and yet in normal driving provides excellent gas mileage. I got 28.8 mpg in about a 70/30 mix of highway to city driving, including a trip to Madison. 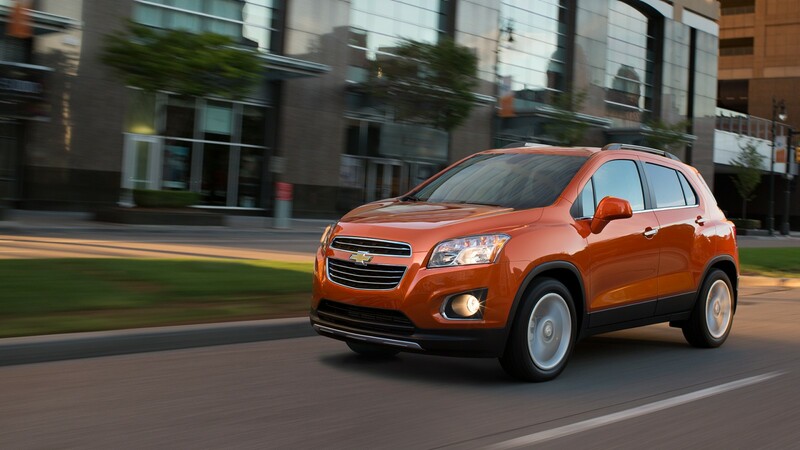 The EPA rates Trax at 26 mpg city and 34 highway. I had four people aboard on the highway ride. All this was in the tested mid-level LT model with all-wheel-drive, listing at $23,945. 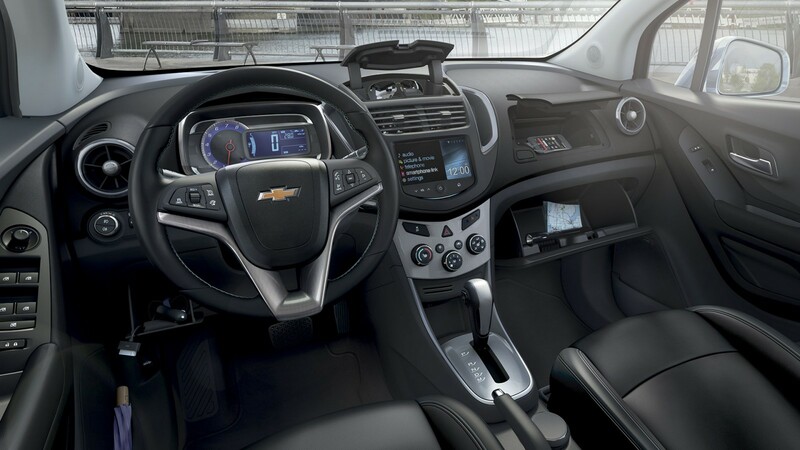 Trax comes with a 6-speed automatic that includes a manual mode. Put the console-mounted shifter in M for manual and two buttons on the shifter knob’s side will upshift or downshift quickly and efficiently. I used the automatic almost exclusively and its shifting was near seamless. There’s a little engine buzz when you tromp the accelerator for power, but nothing like I’ve heard in some even pricier vehicles. Power itself is mild, the 148 lb.-ft. of torque will get the Trax rolling, but as with most modestly powered cars, just 138 horsepower, it lags a bit in the 20-35 mph range. Still, I never felt slow. In Juke’s defense, it has 188 horses and feels quicker. GM’s StabiliTrak system gives the ute good grip in the wet with no tire spin. This also includes traction control and stability control so you maintain full control in the wet. AWD at this price is a value to be sure. Handling is light and easy, making Trax fun to drive and easy to maneuver. It turns into corners well with good precision for its size and cost and is extremely easy to park in crowded parking lots. Ride is extremely good for a vehicle with such a short-wheelbase. Usually you want in the neighborhood of 105-107-inch wheelbase to smooth ride. But Trax handles rough roads well with MacPherson struts up front and a stabilizer bar, while in back is a compound crank torsion beam with coil springs and twin-tube shocks. Some folks look down on the torsion beam system, but with Wisconsin’s crumbling roadways this often is a great solution. I know many won’t believe it, but ride in the Trax was superior to that in the overly stiff Infiniti QX70 I’d driven a week earlier. Brakes are discs all around and perform well. The Chevy’s interior is nothing fancy, but then you wouldn’t expect it to be. I mean the base price of an entry-level LS with front-wheel drive is $20,995, including delivery. Yet seats are extremely comfortable and the dash is well laid out. It’s actually much easier to use than many I’ve seen in $50+ grand vehicles. No mouse or 40-50 buttons to play with, you just drive and adjust the climate controls and radio with simple actions. That’s not to say the Trax is old-school. The red test ute’s interior was black with a mix of cloth and leatherette trim on the seats, and the main gauges included a digital speedometer and trip computer readout, plus handsome blue-ringed tachometer. Several riders complimented its look and feel. Younger drivers may also be happy to hear that OnStar and 4G LTE are standard along with a built-in WiFi hotspot, so you can use all your i-whatevers and smart phones to keep in contact with your digital friends. There’s a USB port in a small glove box atop the passenger’s portion of the dash, along with a bigger glove box below. Trax has three cup holders between the seats for a chai or lattes and an open storage area just in front of the shifter. Another storage box opens on the dash’s lower left, to hide any valuables you may need constantly on board too. In fact, Chevy tells us there are 15 storage areas in Trax. I didn’t count them, but there are quite a few. Other standard features include a manual tilt/telescope steering wheel and rearview camera, plus a 7-inch touchscreen (even works with gloves) for the radio and MyLink system. Everything worked well and sounded fine for those of us who listen to news and sports mostly. Climate controls are manual, but simple to use too. The test ute had no navigation system, but if you have a smart phone, which will plug into the dash, that’s really not necessary anyway. Good storage room behind the rear seat too, and the seats will fold flat. Trax has comfortable well shaped seats and the test unit added the LT Plus package that provides the driver a power seat with power lumbar support and also includes the deluxe cloth and leatherette seat trim, plus a leather-wrapped steering wheel. Cost was $700 after a package discount. The package also added rear park assist on the rearview screen, helpful in parallel parking. Naturally there’s a hatch in back and a wiper there which is helpful when weather is sloppy. 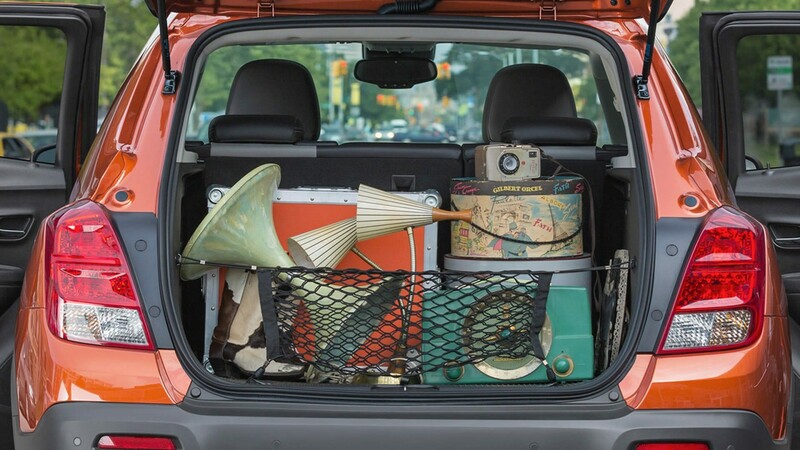 Trax offers a solid 18.7 cubic feet of cargo room behind the 60/40 split rear seat, and if you fold those flat (you have to flip the bottom cushions forward first) you get 48.4 cubic feet of space, again much more spacious than the Juke. Base price for the test car was $23,945 and with $875 delivery and the option package ended up at $25,315. That’s major value for a small AWD vehicle that is this easy to drive and so nicely equipped and designed. Other than Juke on the market now there’s the new Jeep Renegade that will compete with Trax, plus Mazda plans a CX-3. Current models, mostly a little larger, are the Subaru XV Crosstrek, Honda CR-V and Toyota RAV-4, to name a few. 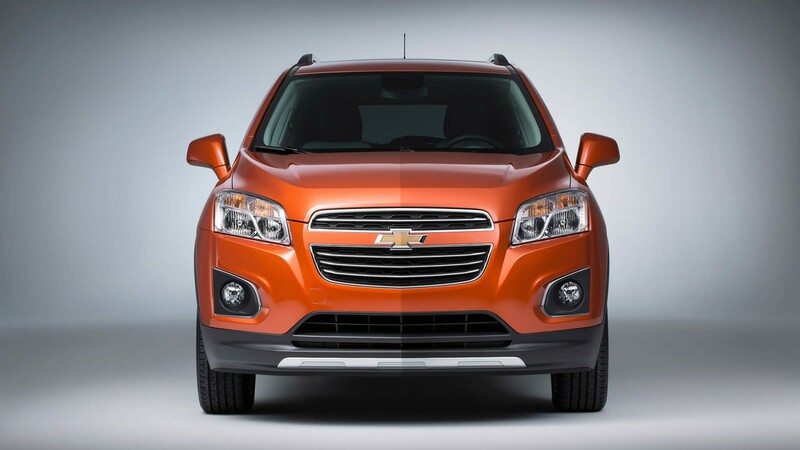 But if you need a small ute and your budget is low, Chevy’s Trax deserves a serious look and test drive. Hits: Nimble handling, good ride plus AWD and starting at less than $24k. Excellent gas mileage, simple attractive interior with comfortable cloth/leatherette seats, hatch and rear wiper, blue ring on tachometer, tilt/telescope wheel, rearview camera, OnStar with built-in Wi-Fi hotspot. Misses: Moderate power and visors do not slide or extend.